I was reminded of this quote from our 33rd President this past week when @LDavidMarquet tweeted it. I, of course, immediately retweeted. On the same tweet, he (Marquet) also asked the question, “What book is sitting on your nightstand?” Those that follow me on twitter, @ByronErnest, know that I can’t resist answering questions. So, I answered that I just finished The Last Place on Earth: Scott and Amundsen’s Race to the South Pole by Roland Huntford and Paul Theroux. 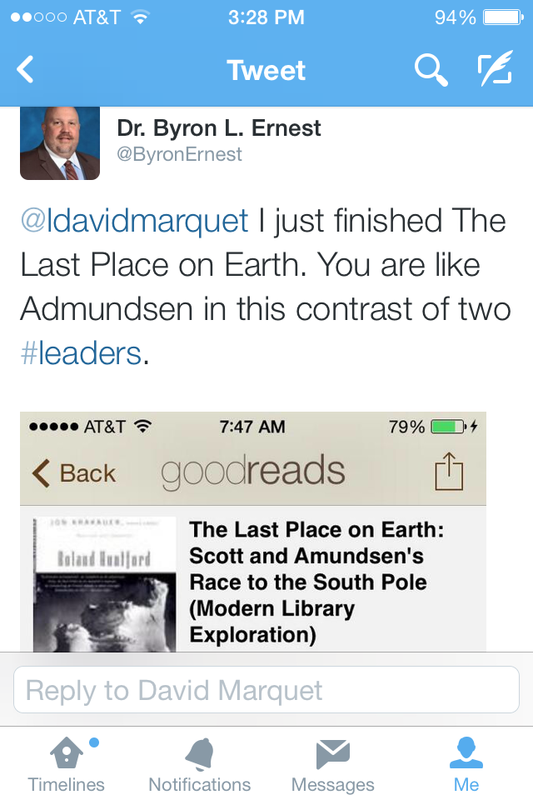 And, since I am such a fan of David Marquet, I had to throw in that he (Marquet) is like Amundsen is this contrast of two leaders. You will also notice from the picture on my response that I am now using GoodReads. It is an awesome way to keep track of books, get recommendations, and make recommendations. It even lets you scan in your books using the barcode. I learned of this app while discussing books with one of our awesome teachers, Allison Marchisani. I love the team we’ve got here because I learn from them every day. This post is not a review of any books. 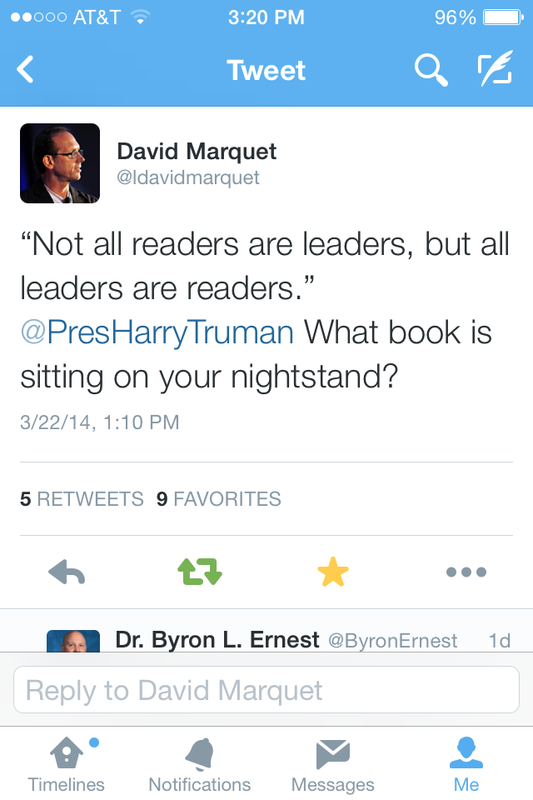 I can guarantee you that I will be posting to my blog about David Marquet, however, in the future. So, watch for that, but today my post deals with the importance of reading. It is interesting that earlier in the week before being asked the question of what book was on my nightstand I was reminded of just how many books I have read this past year. In fact the exact number is 35 since July 1 of 2013. The only reason I know this is because our Media Specialist keeps track of it for our iREAD – I Just Finished Reading program. She sent out a report last week and I was amazed, as was our staff, how many books I had read! Our school has the goal of every student and staff member reading 30 books per year outside of the normal school reading. This is a huge undertaking, but research shows that high school students should be reading 30 books outside of school per year. Therefore, our staff believes that if the students are doing it, we should be doing it. I am excited to already be five over the goal. Keep in mind I read in three modalities: book in hand, Kindle app on my iPad Air, and Audible app for listening. As a leader the benefits of reading are wide-ranging. Evidence suggests reading can improve intelligence and lead to innovation and insight. Reading — whether Wikipedia, Michael Lewis, or Aristotle — is one of the quickest ways to acquire and assimilate new information. Harvard research claimed that reading across fields is good for creativity. As a leader who reads, I can sample insights in other fields, such as sociology, the physical sciences, economics, the military, or psychology, and apply those insights to my own organization. Think about it, I can take the incredible leadership lessons of David Marquet and apply them to my own leadership journey to help us innovate and prosper. So let me explain how we do our iREAD – I Just Finished Reading program: On the honor system, each student and staff member are responsible for reporting to our media specialist the title of each book finished. The media specialist then records the book and makes a laminated picture of the cover. This cover is then put on the walls out in the building (see picture). 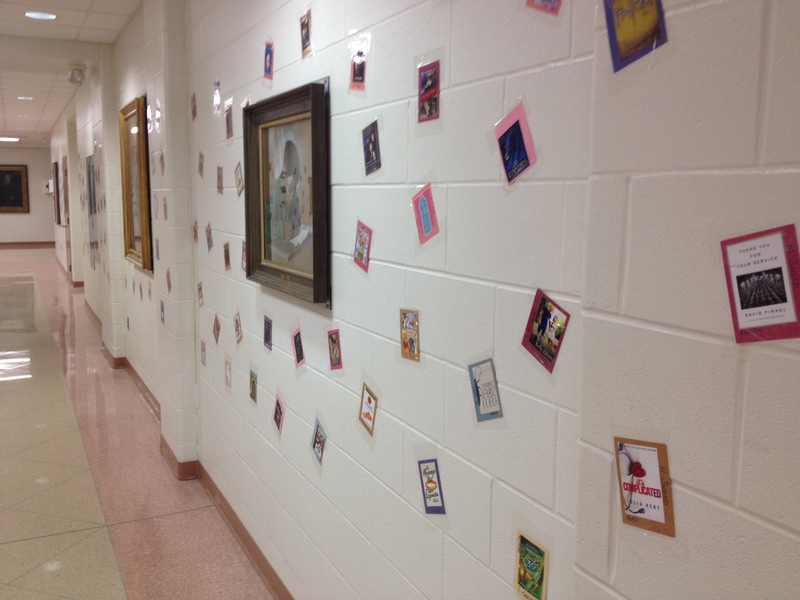 Our halls are filling up with cover pictures. It is great to see students and staff perusing the titles and having conversations about the books. In addition, I have gone one step further with my Principal’s Picks 13-14 Program. 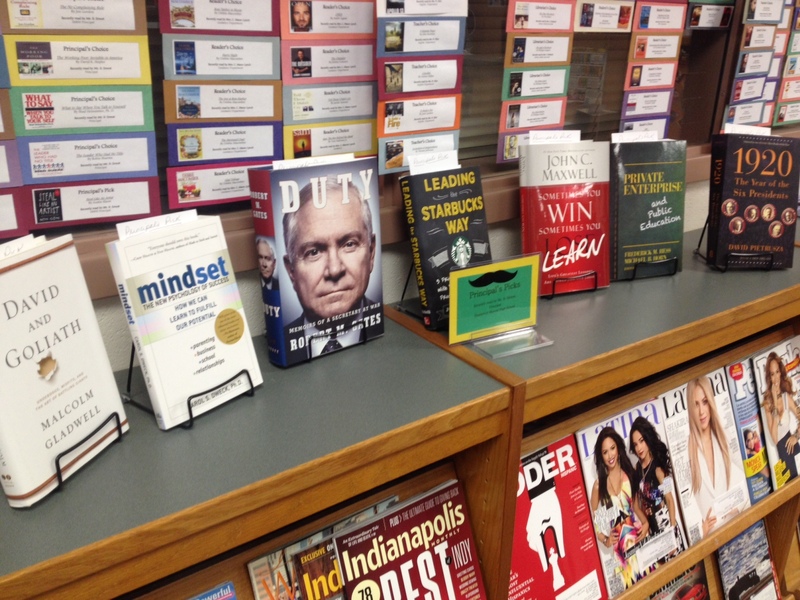 As I finish books I actually buy a copy to be put on display in the Principal’s Picks 13-14 Display (see picture) in the media center. A card is placed in each book and staff and students can sign up to win the drawing for their very own copy of the book. There are usually four to seven books that I have read on display at a time. This has been such a fun way to promote reading. In fact it has become quite competitive when it comes drawing time for the books. There have also been some great discussions about reading that have developed out of this program. As I close this post I would say that I really do believe that leaders are readers. Also, I want to share my list of 35 books I have finished so far since July 1 of 2013. Click on Principal’s Picks 13-14 to see my list. Since everyone will ask which is my favorite of the 35, I’ll tell you: Turn The Ship Around: A True Story of Turning of Turning Followers Into Leaders by David Marquet. Did you make the connection to where I started this post? We are full circle back to David Marquet! Because of iRead I have now made a connection to a great leader and author. Don’t forget if you lead, you must read!! !